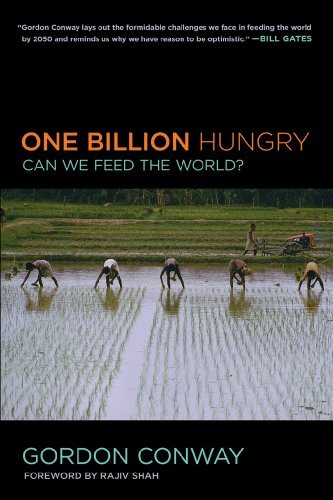 [PDF] One Billion Hungry: Can We Feed the World? | Free eBooks Download - EBOOKEE! [PDF] One Billion Hungry: Can We Feed the World? Description: Hunger is a daily reality for a billion people. More than six decades after the technological discoveries that led to the Green Revolution aimed at ending world hunger, regular food shortages, malnutrition, and poverty still plague vast swaths of the world. And with increasing food prices, climate change, resource inequality, and an ever-increasing global population, the future holds further challenges. In One Billion Hungry, Sir Gordon Conway, one of the world's foremost experts on global food needs, explains the many interrelated issues critical to our global food supply from the science of agricultural advances to the politics of food security. He expands the discussion begun in his influential The Doubly Green Revolution: Food for All in the Twenty-First Century, emphasizing the essential combination of increased food production, environmental stability, and poverty reduction necessary to end endemic hunger on our planet. Conway addresses a series of urgent questions about global hunger: â€¢ How we will feed a growing global population in the face of a wide range of adverse factors, including climate change? â€¢ What contributions can the social and natural sciences make in finding solutions? â€¢ And how can we engage both government and the private sector to apply these solutions and achieve significant impact in the lives of the poor? Conway succeeds in sharing his informed optimism about our collective ability to address these fundamental challenges if we use technology paired with sustainable practices and strategic planning. Beginning with a definition of hunger and how it is calculated, and moving through issues topically both detailed and comprehensive, each chapter focuses on specific challenges and solutions, ranging in scope from the farmer's daily life to the global movement of food, money, and ideas. Drawing on the latest scientific research and the results of projects around the world, Conway addresses the concepts and realities of our global food needs: the legacy of the Green Revolution the impact of market forces on food availability the promise and perils of genetically modified foods agricultural innovation in regard to crops, livestock, pest control, soil, and water and the need to both adapt to and slow the rate of climate change. One Billion Hungry will be welcomed by all readers seeking a multifaceted understanding of our global food supply, food security, international agricultural development, and sustainability. 2014-06-05One Billion Hungry: Can We Feed the World? No comments for "[PDF] One Billion Hungry: Can We Feed the World? ".